North Bliss is great – the approach is minimal and the location is cool, the landings are flat and all the problems are clustered really close together. 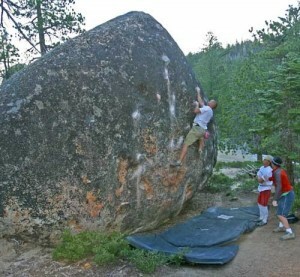 Don’t miss the Spiderman boulders. Great hard problems and, if you dare, there’s a creaky, crunchy highball of doom waiting to go up on one side of the balancing rock. Now, THAT would be proud! If it falls over and squashes you like Indiana Jones, don’t blame me. Once you’re done pulling down, roam around the campground at night making bear sounds and then plunder all the abandoned picnic coolers. Which SuperTopo guidebooks cover North Bliss? Mike Hatchett on The Asteroid.